This title only requires the use of the PlayStation Eye, leaving your hands free to imitate all your favourite Hong Kong movie moments. A long setup process puts you into the game directly in this 2D side-scrolling beat ‘em up, with fights taking place in small arenas. The way you’re represented in the game might remind you of the older Mortal Kombat games. Similar 2D characters wander up to you and try and smack you about, the idea being that you punch and kick your way to victory. You’re attacking to your left or right while looking straight at the TV to make sure you’re not punching thin-air. You can even go for flying attacks by jumping. The on-screen jump comes off a lot higher and floatier, giving you more time to line up a flying kick or hammer-fist. Rather than blocking, you’re encouraged to dodge attacks by ducking, jumping or leaning back, all of which work surprisingly well. Special moves are unlocked throughout the story mode. The first is an awesome power punch, activated by punching with both hands simultaneously in a C-shape, resulting in a move that rockets you across the screen in the same pose. Later on you’ll unlock more skills including a leaping ground pound move that staggers enemies and a time-slowing power, activated by holding your arms in a V-stance, which allows you to rain down the pain in a flurry of blows. You might want to try the Hundred Hand Slap rather the Lightning Leg kick if you’re going to try and imitate some Street Fighter classics though. The size of your playing space isn’t the only problem that you’re going to come across. Your room’s background and how much you stand out against it, together with some fussy lighting requirements all need to be taken into consideration. So unless you have a bright red diving suit and a white photography studio, you’re going to run into problems. And walls. If you’re too close to the camera, your feet will disappear, making kicking impossible. Often your on-screen avatar will develop see-through holes or missing limbs, which unsurprisingly make taking on thugs, ninjas and inky monsters, that little bit tougher. More annoying than any of this is the way you have to physically walk over to your opponents, often putting you right at the edge of the screen and right up to your wall. The arenas that scroll to the side are particularly difficult to navigate as you run out of space to walk, despite being in the confines the game originally stated. You can always use the power punch move to travel across large distances without walking, but you can only use it so many times, and you’ll want to save for hitting people. The story is told through comic books cells as you start off looking after a comic book store, but end up unleashing an ancient demon along with his minions and get swatted between modern and feudal Japan settings. All on your first day too. Between levels you pose in-line with on-screen prompts which are then in turn used to put you directly into the comic book cutscenes. It’s a nice touch that will provide a few laughs, especially if you ham it up for the camera a little. 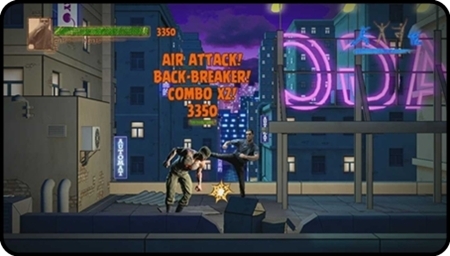 The game can be played in multiplayer, with friends controlling enemy ninjas with control pads rather than turning your living room into a meaty, tooth-spitting brawl. They’ll have to sit really still though or the camera is really going to lose it. There’s definite fun potential for Kung-Fu Live, but you can’t shake the feeling it would have worked better by incorporating the Move controllers, rather than relying on the PS Eye, which hasn’t really evolved since the PS2 EyeToy. Maybe even *whisper it* Kinect would have been a decent choice too. The Short Version: If you can accommodate Kung-Fu Live’s ridiculous space requirements then you should really give it a go. It can be a lot of fun, seeing yourself in your own video game in a way that feels more immersive than putting your torso on-screen and swatting bugs like in old EyeToy games.